Please refer to our stock # MP2-8 when inquiring. Vintage Mashiko-yaki Oozara (large plates) for serving or for dinner plates. Diameter: 10.875" (25.5cm) x Height: 1.5" (3.75cm.) Five different hand-brush-drawn designs on seven plates featuring, flowers, fish, bamboo, and trees (see all enlargements.) The designs were quite modern interpretations of traditional designs when they were contemporary. They are very sturdy in form and design. 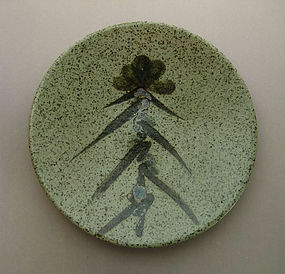 These plates were purchased in Mashiko in the early 1960's and have been cared for for more than 50 years by one owner. The town of Mashiko is located about 70 miles northwest of Tokyo, in Tochigi Prefecture. Although there is evidence of pottery manufacture in the region of Mashiko as far back as the 8th century; production in the modern age began in 1853, making it a relatively young pottery center by Japanese standards. However, whereas many traditional pottery towns disappeared when Japanese lifestyle changes made many functional clay items obsolete, Mashiko has survived and thrived as one of the largest pottery communities in the world. Much of this can be credited to life and work of Shoji Hamada, who decided to settle in this traditional clay village. Although he was a contemporary artist, he showed great respect for the work of traditional artisans, for the natural materials available from the region, and for the â€œOther Power of tradition.â€ He was a leading figure in the Japanese Folk Craft Movement, along with Soetsu Yanagi and others; such as potters Bernard Leach and Kanjiro Kawai, textile artist Keisuke Serizawa, and woodblock printer Shiko Munakata. Hamada was desginated as a National Living Treasure for his preservation of Mingei â€œFolk Craftâ€ pottery and promoted an openess which led many to follow his path to Mashiko. Currently, there are some 400 kilns operating in and around Mashiko making a wide variety of wares; from traditional styles and patterns to modern artistic works.